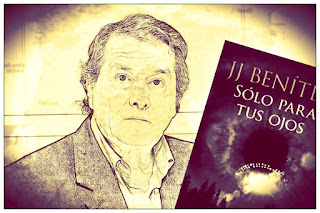 Inexplicata-The Journal of Hispanic Ufology: "If the Military Admitted the Existence of UFOs, Their Scam Would Collapse"
"If the Military Admitted the Existence of UFOs, Their Scam Would Collapse"
Juan Jose Benitez (Born in Pamplona, Spain, 1946) found it necessary to quit his newspaper job due to the stubbornness of the UFO phenomenon. He has never regretted it, although he went through hard times at first. His success is attested by millions of copies of books sold and his reputation, and for having an important member of the military hand him a dozen files to be declassified. Benitez turns 70 this year and wants to celebrate his anniversary with the publication of Solo Para Tus Ojos (Editorial Planeta), a survey of the 300 cases that impressed him the most. It's nearly impossible to choose a single case among all those you've researched, but if the phenomenon's credibility depended on a single one, which would you choose? Indeed, it's very hard because there are thousands and they're very interesting. I remember one in Caracas, Venezuela, experienced by a renowned physician, Dr. Sanchez Vegas. It was in the 1960s and it appeared in the local press as a strange case, about how a person standing a little over one meter tall, with very peculiar physical characteristics (earless, a single lung, heart in the middle of the thorax, etc.) appeared in his office, wearing a metallic suit. His origin was unknown. The truth was stranger than what was featured in the press, and the doctor told me personally years later: he was called to see a patient in a poor neighborhood and was faced with a being displaying serious injuries, fever and a major infection in one leg. It was wearing pants and shirt and was barefoot. It had three toes in front and one in back (sic), six fingers on its hands, arranged like pincers, a disproportionately large head, very large black eyes, dark blood...he ascertained that it had a single lung divided in two. He ministered to the being for weeks in the humble house where it had been taken in. It ate and drank normally. When it began to speak, it told him in poor Spanish that it had to go, as it was being hunted. It only said that it came from "far away" and asked to be taken to a village in the middle of the country, where a native family would take him in. They would know what to do. Before doing so, he took it to his office, where he gave it some medicine. That's when the news hit the press. The doctor chose to make up a story. He took the creature with some friends to the indicated coordinates: the village of San Fernando de Apure. The native family welcomed him and took him to a clearing in the woods. A disk shaped object came down, the being entered the craft, and it rose in the air until it vanished. All this in perfect silence. Before leaving, the being told the doctor that it would return in 2027. I find this case very interesting because it is a first-class witness, a doctor who spent time with the creature and managed to see what happened. It would take a single x-ray of that creature to convince the most hardened skeptic that the phenomenon is real. It was the first thing I asked him when I interview him. He said no, that it hadn't occurred to him at the time. His aim was to cure him. His story seems credible to me because there were many more witnesses: the house in which he stayed, the residents of the village to which he was taken, seven hours away by car. Do you think it was a technology sufficiently advanced to solve the unsurmountable problem of traveling between one star and another? Of course. This is a technology we cannot even intuit. It's like telling Columbus that the voyage that took him three months can be covered today in 8 hours and by air. These civilizations evidently have a technological development at such a level that scientific arguments are obsolete. They can’t come because it is physically impossible to surpass light speed? 21st century science says so, but we don't know what 300th century science says, from the use of teleportation to visiting unknown dimensions that cannot be technologically accessed. If there isn't one single type of UFO, it is logical to assume that there is no single type of occupant. They come from everywhere, then? I have over 2000 types of beings in my files. The morphologies seen are diverse. And I have a minimal part. There isn't a single civilization, but thousands. When explorers go to the jungle, they don't ask who the king of the monkeys is. If there are countless stars and thousands of galaxies, what attracts all of these intergalactic visitors to earth? I think we're very primitive. [Gabriel] García Marquez said we're the most provincial planet in the galaxy (laughs). We're violent, constantly involved in wars, but we live on a beautiful planet. I think that makes us interesting for scientific visits, exploration, adventures or even tourism. There is a classic question that is also essential: it's asked by anyone interested in the phenomenon and not just skeptics. Why are they so elusive? I suppose there must be some kind of universal standard not to interfere on planets that are inferior from the standpoint of development. When we have done it, through colonization, for example, the result has been disastrous. It always ended badly. I'm betting these entities are aware of it and have forbidden it. You cannot intervene in a world that still wages war. Human scientists don't talk to lab rats. Are we facing a similar situation? Something like that. When humans go to the jungle and come across monkeys, they don't ask to meet their king. I further believe that these civilizations are ambivalent: they study, research or monitor, we're not sure what their goal is. Meanwhile, humans try to understand what they're doing here, the military tries to knock them out of the air with missiles and so forth. I understand that a few decades ago, when current recording systems did not exist and people didn't go around with Smartphones, getting unquestioned proof was hard. Why hasn't a witness or researcher like yourself appeared on television with such evidence? Does it not exist? Sure it does. By the dozen. But it is in the hands of the military, starting with crashed vehicles, captured creatures, radar evidence, photographs, etc. Researchers also have proof, but even if you bring them to the stage, it will never have the same probative value that it would if it came from the authorities. This they will not do. They aren't interested. Why? What would fall apart? Their scam. The military of all countries are supported by taxation. If I'm the Army and I tell the taxpayer that there are some civilizations up there that are 50,000 years ahead of us and that there's nothing we can do against them, the taxpayer can reasonably ask why he's paying me a salary for. To protect us against an attack from DAESH? Yes, they're doing that already. It's also a great business for arms manufacturers, isn't that so? Has there been an effort to control you or discredit you? I'm asking about human forces, of course. Of course. I've gone through phases in which public opinion has been poisoned about me, calling me everything except pretty, and I suspect there's been a physical attempt against me. It's logical, though. I'm a troublesome person who’s needling them, calling military men liars.